On Friday, the 20th, an instance of the Supreme Court headed by Justice Javier Villa Stein, hearing matters related to some of the accusations against the members of the Fujimori dictatorship’s notorious Grupo Colina death squad issued its verdict. The members of the death squad -formed from among serving Army personnel- operated out of the military head quarters in Lima, and was commanded directly by then president Alberto Fujimori through his aide and spy chief Vladimiro Montesinos. 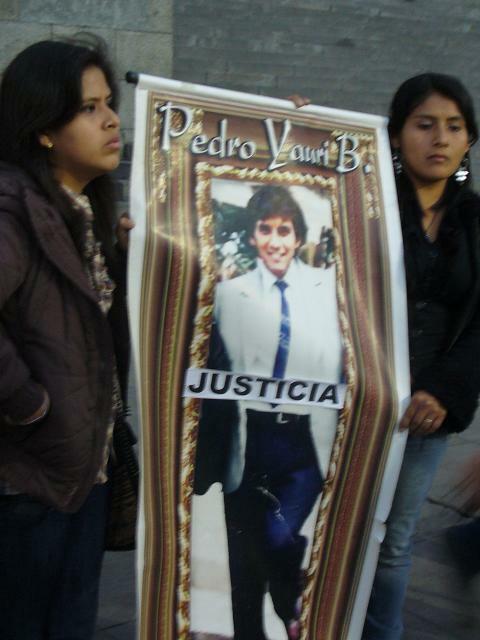 The Grupo Colina members were later shown to be responsible, and convicted, in the torture, murder, and disappearance of journalist Pedro Yauri, union leader Pedro Huilca, nine students and a professor La Cantuta University, fifteen people -including an 8-year old child- in the neighborhood of Barrios Altos, and nine peasants in the locality of Santa in Ancash. The Villa Stein decision found -in contradiction of an earlier Supreme Court verdict- that the crimes of the Grupo Colina did not constitute crimes against humanity (crimenes de lesa humanidad) because such “can only be perpetrated against civilians” and the death squad was formed “to kill terrorists” and terrorists “are not civilians”. In other words, what matters is not the crimes but the supposed intent. Morover, if there is no crime against humanity then there can have been no conspiracy to commit crimes against humanity. The decision thereby reduced the convictions to ones for murder and opened the door to reductions on sentencing and, and even completions of sentences from time already served, and potentially could serve as a mechanism for the release from prison of Alberto Fujimori. The decision has been roundly condemned -from the President’s office on down- as the details and implications of it have become clear, and Villa Stein has come under suspicion due to a series of changes made in the composition of the bench in the course of the proceedings. 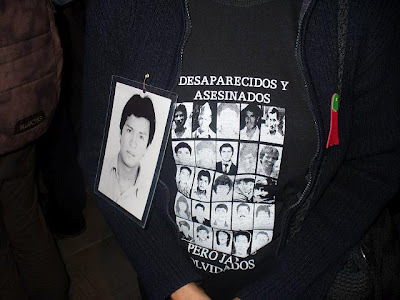 Human rights groups and the victims’ families called for a show of indignation in front of the Palace of Justice for Monday evening, a call which was assisted by La Republica newspaper announcing the demonstration on its front page. Spotted at the protest: CGTP, Integracion Estudiantil, delegation from La Cantuta University, Coordinadora Contra la Impunidad, human rights coalition, Estudio para la Defensa de los Derechos de la Mujer, Lima Homosexual Movement, Lesbianas Batukeras, victims’ relatives, etc.